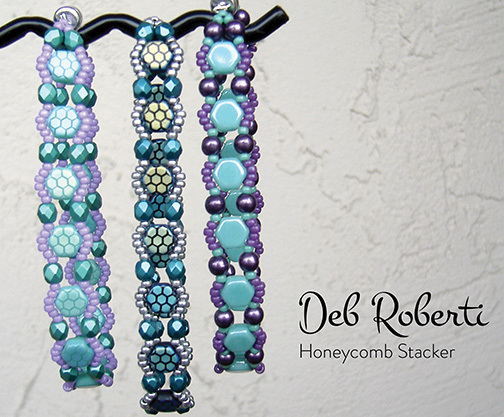 I just love the new laster etched Honeycomb beads that have hit the bead scene so I revised my Tile Bead Stacker to showcase these awesome beads. Triple the length and make some super wrap bracelets! Downloadable PDF, links to exact beads used at the end of the page. Step 1: Thread your needle with about 2.5 yards of FireLine (or start with a length that you feel comfortable with and add more later). Leaving about a 6-inch tail that you can weave in and make disappear at any time, string a seed bead and go through the bottom hole of a Honeycomb bead. String a seed bead, a 4mm bead, two seed beads and a 4mm bead. Step 3: String four seed beads. NOTE: If you are using Toho brand rocaille seed beads, which are a bit fatter than the Miyuki brand seed beads, you may only need three seed beads in this step and all other steps that call for adding four seed beads. Step 4: String four seed beads. Step 5: String a seed bead. Go through your clasp and then back up through the seed bead that you just strung. Step 7: String a seed bead, a 4mm bead and a seed bead. 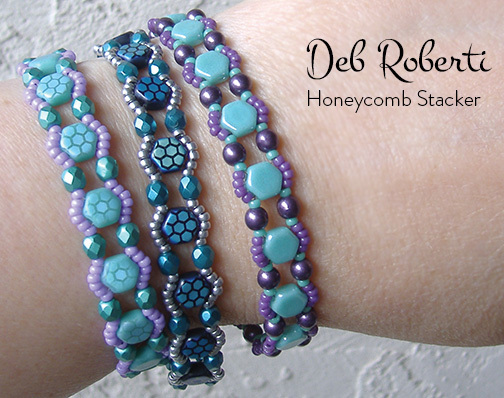 Go across through the bottom hole of a new Honeycomb bead. String a seed bead, a 4mm bead and a seed bead. Step 10: String four seed beads. Step 11: String four seed beads. Step 14: String a seed bead, a 4mm bead and a seed bead. Step 16: String four seed beads. Step 17: String four seed beads. Step 20: To attach the other end of your clasp, string a seed bead, a 4mm bead, two seed beads, a 4mm bead and a seed bead. Step 22: String a seed bead. 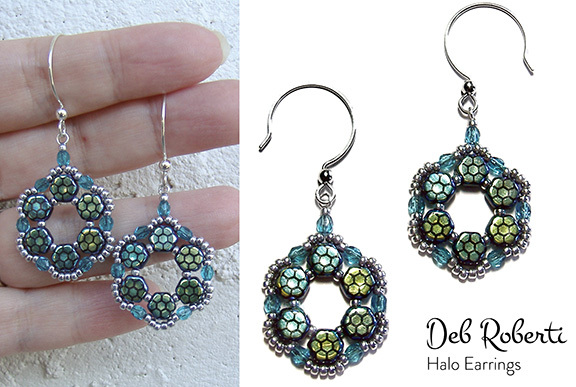 Go through your clasp and then back down through this same seed bead that you just strung. Weave back around and go through your clasp one more time. Use your extra tail thread to go back through the beads along the outer edge of both sides of your band. Knot in several places and then cut your thread.